Our smallest version with all the volume and performance you require, and a perfect fit for decks and duck boards. Perfect for a cruising couple with few visitors. 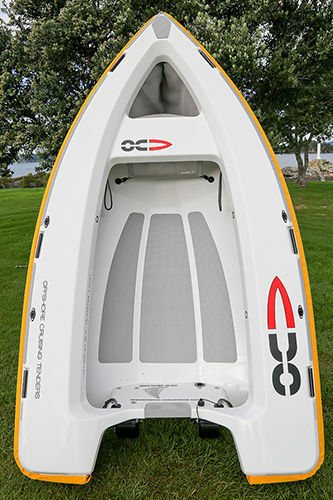 Tender, black rub rail cover, full non skid on deck, extra non skid on cockpit floor, rub streak, 40cm X 40cm stern drag plate, delta point drop plate, oarlocks, oars, anchor bag, mesh tank bulkhead, two side storage bags, two seat blocks, davit lifting eyes.